The movie Grumpy Old Men and its sequel Grumpier Old Men are comic portrayals of anger in older men. The reality, however, is far from funny. According to the Science Daily, the stress chemicals that are released during anger episodes can speed the onset and progression of Alzheimer's disease, and contribute to a faster-than-normal reduction in lung function due to aging. 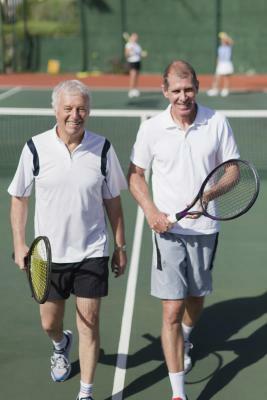 Older men may have a difficult time adjusting to retirement. For many older men, a career was not just a job but a way of defining themselves. They may struggle with the lack of structure that comes with retirement, and a lack of a sense of self. Financial stress may also be a factor after retirement, since living well on a fixed income can sometimes be difficult or even impossible. This increased stress can translate into a high level of irritability, and may increase the number and intensity of anger episodes in older men. Chronic anger and stress can also lead to the beginning of a drug and alcohol problem, or exacerbate substance abuse that was already occurring. Substance abuse can cause erratic behavior, including anger or irritability. With the loss of inhibitions due to drugs and alcohol, this anger can quickly spiral out of control into physical violence or emotional abuse of a spouse or caregiver. 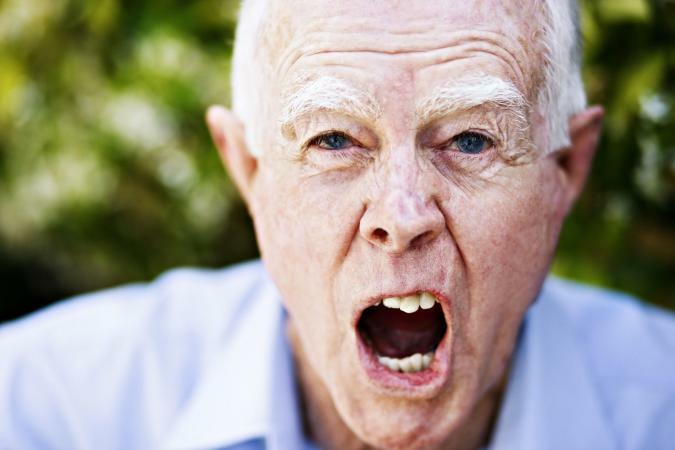 Anger in older men may also have its roots in biological disorders. Depression doesn't just present as apathy and inactivity, but can also cause severe irritability. According to the American Psychological Association (APA), depression is becoming more common among older adults. Depression also has other hallmark symptoms, such as a depressed mood, feelings of worthlessness, and even suicidal thoughts or actions. Anyone experiencing these or similar symptoms should immediately see a physician. 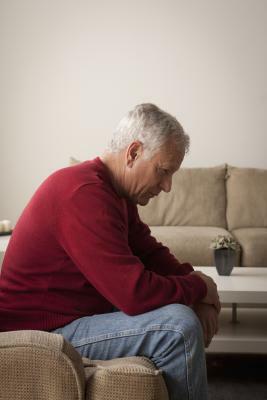 Older adults may have particular difficulty getting help for their depression, as there is still a stigma associated with any type of mental illness, but it is especially important for older adults who are depressed to seek help, as untreated depression can have serious consequences on emotional health. According to the Alzheimer's Association, Alzheimer's disease can cause changes in mood or behavior, including an increase in irritability. The increased confusion that Alzheimer's patients suffer can make them very sensitive to small changes in routine, or any type of new experiences or surroundings. If The Alzheimer's Association offers a list of ten common signs of Alzheimer's, and anyone believing that they or a loved one might be showing symptoms should see a doctor as soon as possible. The best approach to control and reduce anger in older men is to take care of the basics first. A thorough physical exam by a doctor and a screening by a qualified psychologist for any mental or emotional problems is a great first step to identifying any underlying conditions. If any contributing conditions are present, these should be treated with medication or therapy. Older men may be resistant to the idea of talk therapy, but action-oriented cognitive therapy may be a bit less intimidating to them. After checking physical and emotional health, it's important to strive for a healthy lifestyle. Sleep deprivation can increase irritability, so men should strive to get at least six to eight hours every night. Regular exercise is also a great stress reliever, and can help dissipate tension that may lead to angry outbursts. Twenty to 30 minutes of exercise on most or all days is a great target, but even exercising a few days a week is a great first step. Older men's anger issues may have different roots than that of their younger counterparts, but the remedy is much the same. Living a healthy lifestyle, reducing stress, and promptly seeking medical attention for physical and mental illnesses can all help to reduce anger and make it more manageable. Conventional anger management classes do not usually focus on specific age groups, but senior centers may offer workshops on anger control or anger management designed especially for mature men.